The majority of Websites are constructed with a single homogenous user in mind, or a limited number of user profiles, usually from one country or culture. In order to accommodate the international growth of the Internet, this mono-cultural bias of Website design must change. 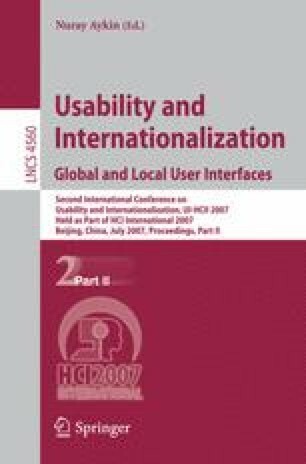 If crucial steps of user-centered user-interface (UI) development for Websites are omitted, which happens when people unconsciously apply their own rules to interactive communication intended for others, effective communication of the Website will be less successful, or may even be dysfunctional. People from different countries/cultures have certain expectations of a particular site that may differ significantly from other countries/cultures. For example, many middle-class Germans may typically prefer a design that is more subdued and easy to navigate, while many middle-class Mexicans may prefer a more colorful screen and tolerate more ambiguity. The present study is derived from the previous efforts of Marcus and Baumgartner [4, 5]. Using five cultural dimensions (from Hofstede, as a useful, well-known set) and the schema of five UI design components, Marcus and Baumgartner created a five-by-five matrix that allowed for twenty-five fields of interest. The authors analyzed 12 corporate business-to-business and business-to-consumer interactive Websites and found patterns in divergence from corporate design standards. Baumgartner, with Marcus’ assistance, also analyzed a set of 29 culture dimensions abstracted from nine models and presented to a group of 57 experts. The two authors analyzed the experts’ evaluations of the importance of each dimension . They reviewed this list to derive which items comprised the top five in levels of importance. “Best of breed” culture dimensions are context, technology, uncertainty avoidance, time perception, and authority conception, in that order. Context is described as the amount and specificity of information in a given communication. The cultural dimension of technology is comprised of the experience of technology and technological development. As a cultural dimension, technology has to do with the development and attitude of the members of a certain society towards technological development. The cultural dimension of uncertainty avoidance takes into account the behavior of the user regarding uncertain or unknown situations. Time perception concerns whether one has a long- or short-term orientation to achieving objectives and whether one is oriented to the past, present, or future. This cultural dimension can be related to the perceived amount of time that it takes to comprehend and utilize a Website. Authority conception concerns how people think of authority and the way their behavior is influenced when reacting to a Web UI design as official and authoritative, or not [4, 5]. Hofstede’s five cultural indexes include power distance, individualism vs. collectivism, gender roles, uncertainty avoidance, and long-term time orientation. Power distance is defined as the extent to which the less powerful members of organizations and institutions (like the family) accept and expect that power is distributed unequally. This index measures whether or not there is a strong representation of inequality of a society. Individualism is the opposite of collectivism. This index demonstrates how loose or tight the ties are between individuals and their society at large. Masculinity is generally understood to be the opposite of femininity. This index refers to the roles people play according to their genders. Uncertainty avoidance concerns a society’s tolerance for uncertainty and ambiguity. This index includes to what extent a culture programs its members to feel either comfortable or uncomfortable in unstructured situations. Long-term time orientation is generally the opposite of short-term time orientation. Long-term time orientation values thrift, education, and perseverance, while short-term time-orientation is concerned more with the achieving short-term goals, fulfilling obligations, and protecting one’s self under changing conditions ’. This study concerns an analysis of certain (undisclosable) public-facing pages of a financial-related Website by individuals from different countries and cultures. Based on the previously cited studies and after Website design interviews with twenty-four individuals from eleven different countries, the authors of this paper intend to shed light on these two questions: which dimensions seem to have the strongest impact or effect on a particular ethnic group? What considerations about culture should developers take into account when designing Websites for specific cultures/countries? The authors used a working Website and carried out user-preferences tests. Preferences were extracted from a questionnaire of seven distinct questions that were based on the usability of and user opinions of the Website. The questionnaire consisted of three parts. The first part inquired about demographic variables. The second part contained questions based on the navigation of the Website. The third part measured the user experience and preferences. The goal of the user tests was to examine whether users with culturally different backgrounds experience and evaluate Websites in a way that is consistent with their culture-specific attributes. The participants selected for this experiment ranged from students to professionals, with an age range of 20-50, all living in the San Francisco Bay area of California. The participants had been living in the United States for less than five years and came directly from their respective countries, which included Argentina, Canada, France, Germany, Italy, Mexico, the Netherlands, Poland, Russia, Slovakia, and the United Kingdom. When comparing the final results with Hofstede’s cultural dimensions, the following results became clear: cultural dimensions must be considered in order for a Website to be effective. For example, cultures like Russia and Slovakia, with a high level of power distance find Websites most useful when they have concise language and demonstrate a high level of professionalism. Countries such as Germany, the Netherlands, Poland, Great Britain and Canada, which have a shorter-term time orientation, desire a Website that is quick to navigate and does not require a lot of time and effort through which to browse. Participants from countries with a high index score for uncertainty avoidance, such as Argentina, France and Mexico, are not trusting of Website content, want Websites that look highly official and professional, want them in their own languages. Countries that ranked relatively higher in individualism, such as Italy, need to have a Website design that is particular to their culture and country.